Peace of Mind Essential Oil Blend diluted in Massage Base (ready to apply). Soothing and calming, this lovely, healing blend helps overcome everyday anxiety and stress. 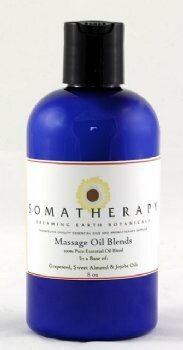 Premixed in our Massage Base and ready to use for a soothing massage or add a cap full to a warm bath. A blend of 100% pure Essential Oils: Geranium, Lavender, Marjoram, Melissa, Neroli, Tangerine and Ylang Ylang in our Massage Base (a combination of Sweet Almond, Grapeseed & Jojoba oils).